My boys each got handheld video games for Christmas, Cameron got the Nintendo DS and Tyler got a leapfrog. We knew that they’d like them but, as is the case with many children, they’ve become the subject of complete obsession. The first question in the morning is if they can play their games and it continues on until it’s the last question of the day. If they had their way they’d be staring at those games through out the entire day. My wife had the idea to get a large green piece of paper and make a chart for each of them. She filled the chart with all sorts of things from chores to bad behaviors and at the end of the day, we check to see what they did and didn’t do… for all the good things, they get a sticker, for the bad, they get an X. An example of some of the chores would be putting dishes into the sink, tidying up their toys, making their beds… and some examples of the bad behaviors that made it onto the board are “no yelling”, “no hitting” and so forth. If at the end of the day, they didn’t fight, they get stickers. There are some good behaviors listed as well, of course, such as “playing nicely together” and “sharing”. At the end of each day, we all gather at the chart and see what they did well and what they didn’t do or worse, got X’s on. The first day, Tyler cried when we asked him to turn off his game. Turning off their games without complaining is on the list. Well, for his outburst, he got an X. Each day, when they ask to do something they like, such as playing their games, we review the chart for the day before. If they did well, then yes… they get some video game time. If they got X’s or missed a bunch of things, then they lose out on game time. That means they had better improve if they want to have game time the next day. It’s an excellent lesson in cause and effect. I’m not sure this system will stay exactly as is but there’s no reason that this can’t continue on for many years… eventually moving on to dictating how much allowance they get when they’re older. Hopefully, in time, it’ll sink in with them that their entire lives can be met with nice rewards if only they put in the effort in advance. It’s definitely not a new system, I’m preaching to the choir by telling you all of this. I’m not trying to give you any new ideas, just let you know what we’re doing around the Duncan household these days. So far it’s been a huge success. Oh, by the way, one thing I did want to mention though is that Cameron is 5.5 years old and Tyler is 3. Cameron has Autism, Tyler does not. This system can be started at any age really but I find that their ages right now are ideal. It has especially been great for Cameron who so very desperately needs a good routine in his life. Not only does this give him a list of things to do each and every day but it encourages him to over come some of those basic Autism tendencies, such as hitting and meltdowns. When he begins to lose control, we remind him that he’ll get an X and lose out on game time tomorrow and it helps him to calm it back down. The best part about it all, I think, is how proud they are each day of all the stickers they got for doing so well. Its great that the system is working. It is interesting how the basic ideas of rules, routines, cause and effect are lost on so many of today’s children.You are doing for your children a wonderful thing. You are right about this not being a new idea, but it might be to some parents. You have reinvented a system to make it MEANINGFUL to your boys, that’s what works along with the consistency you and their mom brings to it, it should work as long as you need it to. 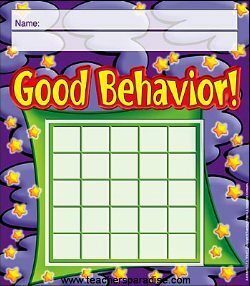 What a great way to change behavior and reinforce appropriate behavior.